Jeffrey Tinkham joined Martin, Disiere, Jefferson & Wisdom, L.L.P., as Of Counsel to the firm in November 2003. 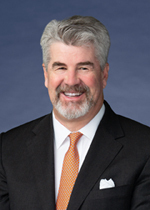 Prior to joining the firm Mr. Tinkham was the managing partner of Williams and Tinkham for 14 years. Mr. Tinkham has extensive experience in bankruptcy, creditors’ rights, and commercial litigation. In recent years, a significant portion of his practice has involved the representation of defendants in adversary proceedings in bankruptcies, including the Enron and Lyondell cases in New York. Mr. Tinkham has also represented creditors in numerous bankruptcy proceedings. Additionally, he has collected hundreds of judgments, and is well versed in exemption issues, dormancy issues, and turnover proceedings. Much of Mr. Tinkham’s commercial practice has involved representing financial institutions against corporate debtors and guarantors. Mr. Tinkham has also been involved in real estate related matters, including title issues and landlord/tenant issues. Additionally, he has represented clients in appellate matters, most often in bankruptcy related appeals. He is licensed to practice in all state and federal courts in Texas, including the United States Court of Appeals for the Fifth Circuit, and has appeared pro hac vice in bankruptcy courts outside of Texas on many occasions.